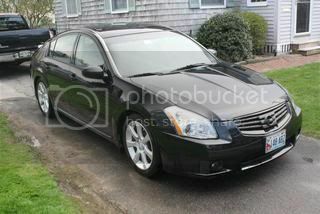 hey guys this is my black 05 maxima 6 speed. enjoy!!. plan to get better pics tomorrow when it isnt raining. Looks great. Love the wheels. What are your springs? Onyx !! I like ! Another one joins the Black Mafia Family!!! Welcome to the Family! Gorgeous wheels! Welcome fellow black owner! Great looking car, like the simple look. Nice!!!!! Another member added to the BMF crew!!! Thats how we roll. Welcome to the club. What kind of brakes are those? I see a large caliper with regular disk? its got the wilwood brake calipers . thanks guys!!! i still got some work i wanna do to it. i was looking into coilovers and it seems like tein is the best to go with for maxi ? saw some bc racing ones for sale on maxima.org , how do those hold up ? looking great so far, not too many guys on the BC coilovers, for some reason.